Qin Xiaoyu, ed, Iron Moon: An Anthology of Chinese Migrant Worker Poetry Translated by Eleanor Goodman. Buffalo NY: White Pine Press, 2016. The last twenty years or so have seen the emergence in mainland China of a poetry commonly referred to as dagong shige (打工诗歌). English renditions to date include “labor poetry,” “workers poetry,” and “migrant worker poetry.” This is writing by members of the underclass of domestic migrants who have flocked from the countryside to the cities since the 1980s. They have done so in the hundreds of millions, to realize dreams of economic well-being and urban adventure – or, to end nightmares of unemployment, destitution, and the strictures of village life. Their labor is fundamental to the functioning of a society in the midst of frantic economic development that is driven by global capitalist consumption as much as by the growth of a Chinese middle class. Manufacturing, construction, the service industry, broadly defined to include anything from office work to prostitution: any place that needs bodies to “work for the boss,” as Sun Wanning aptly glosses dagong in its original, generic sense. “They sweep the streets, work and sleep on the ubiquitous construction sites, drive the trucks that bring goods into the cities, and clean the floors in restaurants and businesses,” writes Eleanor Goodman, the translator of Qin Xiaoyu’s 秦晓宇 Iron Moon: An Anthology of Chinese Migrant Worker Poetry and the subtitler of Qin Xiaoyu and Wu Feiyue’s 吴飞跃 documentary Iron Moon, the book and film under review here. Many of these people work under horrifying conditions. Long hours, mind-boggling health and safety risks, forced on-site accommodation limiting free movement, disruption of social structures (families, village communities) and personal development (sexuality, parenthood); low wages, inadequate or abusive contracts, and little in the way of legal rights, most notably the right to the coveted urban Household Registration (户口), for access to things like affordable healthcare and education. And some write poetry. In the 1990s, dagong poetry mostly appeared in unofficial and occasional print publications such as company journals and material circulated at poetry recitals. From around the year 2000, the internet has boosted its dissemination and raised connectivity and group consciousness among poets and readers, through websites, blogs, and other social media. Since the mid-2000s, it has appeared in mainstream literary journals, individual collections, and multiple-author anthologies, in print and online. The hardships and the social injustice of migrant worker life, from the material labor conditions listed above to feelings of displacement, nostalgia, and existential alienation, are among its most prominent themes. Overall, dagong poetry has gained considerable domestic visibility, first in literary and scholarly circles and later in mainstream media. In recent years, it has also featured in foreign scholarship – English-language examples include essays by Sun Wanning, Justyna Jaguścik, Heather Inwood, and Gong Haomin – and attracted the attention of labor activists, journalists, and cultural brokers outside China. This was catalyzed by the suicide of Foxconn employee Xu Lizhi 许立志 in September 2014. The Shenzhen Foxconn plant has long been notorious for the cruelty of its labor regime, and the many suicides associated with same. Xu’s story, highlighting the fact that he was a poet as well as a factory worker, sparked a storm of domestic and international publicity. In English alone, this ranged from activist platforms like the China Labour Bulletin and Libertarian Communism to mainstream media like Time and highbrow publications like the London Review of Books. Iron Moon is the first substantial effort to make a wider range of dagong poetry accessible in English. Presenting work by no fewer than thirty-one authors, the anthology gives the poetry itself pride of place, rather than citing it as source material for human interest stories or social-scientific research (nothing wrong with either, by the way). As such, this book is a rich new resource for students, scholars, labor activists, and the general reader. Dagong defies simple one-on-one translation. In terms of linguistic register, it is an informal, colloquial word. In addition to working for the boss, it often connotes manual, physically heavy, low-status labor. Crucially, many of those who dagong do so on temporary or casual contracts, or without any contract at all, and frequently change jobs, not necessarily of their own volition. They live with economic uncertainty, and are not in control of their future – from next year, or next month, or from tomorrow. This reduces their ability to build and sustain social relationships, in the nuclear family and beyond. “Labor poetry,” “workers poetry,” and “migrant worker poetry” do not convey all of the above. The colloquial and informal register of dagong is by and large lost in all three cases. Also, certainly in the context of PRC literature, “labor poetry” and “workers poetry” lead to echoes of Maoist poetics that are inaccurate at best and misleading at worst. And “migrant worker poetry” is an explanation rather than a translation. As for alternatives, one might consider “precariat poetry,” to indulge academics and activists. Or “sloggers poetry,” to picture the people that this is about less distantly. Or “grindstone poetry,” to emphasize the merciless machinery of manufacturing, construction, and so on – but grindstone poetry is somehow too cute, or too clever. Or “working-for-the-boss poetry,” which comes close, but is a mouthful. For Iron Moon, Goodman’s decision to call this an anthology of “migrant worker poetry” is eminently sensible. It is also in line with editor Qin Xiaoyu’s ideas on terminology. Qin is one of those who hold that the notion of dagong poetry is problematic in Chinese to begin with. They argue, first of all, that dagong’s generic meaning far exceeds its specific association with migrant workers and China as the workshop of the world, and that it has denigrating hues when used in connection with migrant workers. Second, some of the poets in question no longer write, or have never exclusively written, about dagong. Third, a fair number have levels of formal education and/or professional skills that are not normally associated with (clichéd images of) dagong. While they may have started at the conveyor belt or the cement mixer, they have long since moved on into office jobs or found their way out of dagong altogether. This point invariably triggers the example of Zheng Xiaoqiong 郑小琼 (b. 1980), one of the best-known dagong poets. Zheng hails from Sichuan, where she was trained as a nurse. She moved to the Guangdong city of Dongguan – an early hotbed of migrant worker poetry – in 2001 and worked as a laborer in a long list of factories (tools, toys, audio-cassettes, furniture, steel, plastic cement). She gained growing recognition as a poet in the late 2000s and then found steady work as an editor at the influential Guangzhou-based journal Literary Works (作品). These are valid considerations, but there is no reason to think that dagong shige will relinquish its position as the default term in China any time soon. Senior champions of the poetry in question such as Liu Dongwu 柳冬妩 and Yang Honghai 杨宏海 have used it ever since the 2000s, not a few of the poets in question themselves do so, and it is firmly anchored as the most widely used term in popular discourse. This is unsurprising, inasmuch as poetry + dagong appeals to the imagination, and lends itself well to romanticization and infotainment. The migrant worker as a twenty-first‑century Chinese incarnation of the poète maudit, cursed by other powers than were their late nineteenth‑century French forebears. 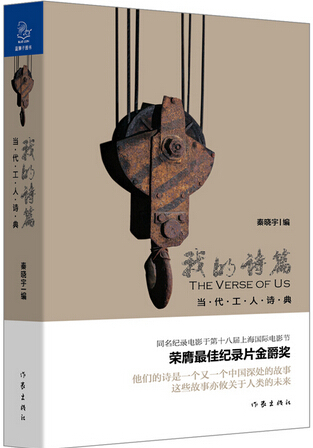 Cover of the Chinese edition of Qin Xiaoyu’s anthology of workers poetry. Still, one can see why Qin and others consider nongmingong shige (农民工诗歌) “rural migrant worker poetry” the preferred label for the kind of writing translated in Iron Moon. Interestingly, the big Chinese book published in 2015 of which Iron Moon is a generous excerpt casts its net much wider, and speaks of gongren shige 工人诗歌 “workers poetry” at large. Its title translates as My Poetry: A Canon of Contemporary Workers Poetry. From the uncontroversial nongmingong to its slightly politically incorrect abbreviation mingong and the highly politically incorrect mangliu 盲流 “blind flood,” terminology for the migrant workers is “sensitive” vocabulary in China (here, political correctness is determined by government rules). While it is unmistakable that the migrant worker poetry presented in Iron Moon is also at the heart of My Poetry, the English anthology’s Chinese mothership, it may well be that My Poetry’s presentation of migrant worker poetry as subsumable under a broader category of workers poetry was in order to avoid censorship. On that note, Qin’s extensive introduction to My Poetry shows him expertly navigating the politics of Chinese-domestic literary criticism. Reassuring references to Marx come through like clockwork in an essay that raises thorny questions for a political regime claiming to represent the interests of the laboring masses, migrant and otherwise. This takes us to a central question about Iron Moon. Is this poetry that happens to be about migrant labor or a manifesto about migrant labor that happens to take the form of poetry? This is, of course, a schematic way of putting things, for the argument’s sake. And reading the book – and watching the film, to which we will turn below – will hardly move anyone to simply tick one of the boxes. To be sure, Qin’s introduction and Goodman’s afterword are more about migrant labor than about poetry. But why shouldn’t a poetry anthology be socio-politically motivated, and why shouldn’t its makers say that it is? In the poetry itself, one is struck by a diversity of voices and by an immediacy and individual presence that meaningfully complement the expository prose of, say, NGO publications. In Sun Haitao’s 孙海涛 (b. 1978, from Hunan) poem “Employment ID,” the phrases 时光凝固 and 时光流逝 are rendered as “The light affixes” and “The light passes,” where one might expect “Time congeals” and “Time passes.” In Xie Xiangnan’s “Work Accident Joint Investigative Report” (一起工伤事故的调查报告), referred to above, 一起 … 报告 means “a report” rather than “joint report,” with 起 as a measure word. There are quite a few other places where the translation appears rushed, and could have done with thorough revision. Part of the explanation may lie in the sheer scope, and perhaps the somewhat uncontrollable energy, of Qin Xiaoyu et al’s project as a whole during the past few years. At about 550 pages, the compilation of My Poetry (formally started in March 2014) must have been a tremendous amount of work, not to mention the eponymous documentary Qin set out to direct together with Wu Feiyue (formally started in May 2014). Then, in September 2014, as both book and film were well underway, Xu Lizhi – who was going to be featured in the film – committed suicide. This catapulted him into national and international headlines, and Qin additionally undertook to edit Xu’s A New Day. 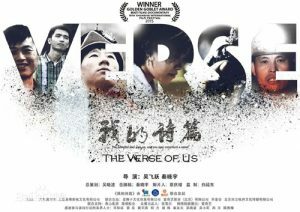 In February 2015, he convened a major symposium on, and recital of, “workers poetry” in Beijing, which produced more text for the book and more footage for the film. A New Day came out in March. My Poetry was published in August – subtitling its Chinese name on the cover as The Verse of Us – and Chinese and international editions of the film were released for the festival circuit in November 2015, with the international edition eventually renamed Iron Moon. There were about a thousand crowd-funded domestic screenings of the film in 2016. 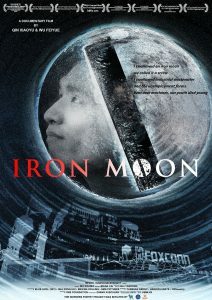 Outside China, after screenings in Taipei and Amsterdam in late 2015, Iron Moon was screened in several cities in the US in November 2016, in university and labor activism settings. Chen Nianxi 陈年喜 (b. 1970, from Shaanxi), another of the poets featured in the book and the film, accompanied Qin Xiaoyu and Wu Feiyue on this trip. One estimates, then, that preparations for the English-language anthology began in earnest at some point in 2016, with Qin and his co-workers pushing for publication at the earliest possible date, to coincide as closely as possible with media coverage of the film, whose domestic cinema release was planned for early 2017. If this is, roughly, how things unfolded, there would have been little time for the translation process, which would help to explain the translation errors – and typos that should have caught the publisher’s eye, in what is otherwise a beautifully produced book. Something similar holds for Qin’s introduction, which he appears to have adapted from the long essay that opens My Poetry. More pointedly tailoring the piece to its foreign readers would have been worth the effort. While the errors are regrettable, Goodman is to be commended for the many places in which she handles the particulars of migrant worker poetry astutely in terms of style. If we allow for some generalization, this poetry tends to be less polished – to cite a cliché that may fit the present context better than most – than professional writing. It is, for instance, often unsteady or unbalanced in terms of register and tone, line length, rhythm, and so on. This raises the old question of whether the translator is at liberty to “improve the original,” and of what determines whether the changes they make are improvements. Beyond textual and linguistic issues, this question often involves reflection on cultural difference and, sometimes, more directly political considerations of what one wants the translation to be and do – with migrant worker poetry, prison writing, and so on as cases in point. On the whole, in this respect, Goodman’s engagement with the texts is highly effective, especially because she knows when to honor the literal, and when to shun it. For the great majority of the poems, she treads a fine line between respecting the original and ensuring that the translations read well, maximizing the chance that the reader will stay tuned and get the message. In all, the poetry in Iron Moon remains true to life in translation, so to speak. Often, then, Iron Moon is a manifesto about migrant labor that happens to take the form of poetry. And sometimes, it is poetry that happens to be about migrant labor. And of course, one need not tick either of these boxes for individual poems anymore than for the book as a whole, and one can perfectly well tick both. While Iron Moon would have benefited from better editing, it is a groundbreaking work, and it will speak to a wide readership in the academy (Chinese / Asian studies, literature, cultural studies, migration studies, sociology and anthropology), labor activism, and elsewhere. All libraries should have it, and those with Chinese-language holdings should also purchase the mothership. And at US$ 16, it should be affordable to many individual readers as well. 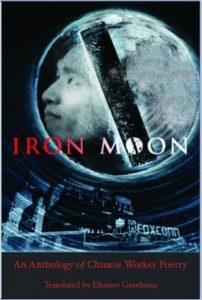 Iron Moon (international edition). dirs. Qin Xiaoyu and Wu Feiyue. MeDoc / Shanghai Eternity, 2015. Poetry’s presence in the film called Iron Moon is fundamentally different from its presence in the Chinese and English anthologies. This is only natural, as books won’t fit into films in terms of text – if they did, the films in question would really be books. But the difference is especially conspicuous because this is about poetry, a genre whose cheerfully doomed definitions often invoke its unparaphrasability. Iron Moon is interspersed with written and spoken moments of poetry, and this adds an inspirational angle. But the film portrays the lives of five individuals, and the larger historical narrative of which they are a part, rather than what they write – even if in some cases, there is plenty of reflection on why they write. Lao Jing 老井 (b. 1968, from Anhui), a coalminer, has lived and worked in Anhui all his life, and held more or less steady jobs. Perhaps this is why he is the only one of the film’s protagonists whose work is not included in the English anthology. Lao Jing writes to remember, and to bear witness. Remembrance turns to survivor’s guilt when he writes to twenty-seven of his fellow miners who lost their lives in one of the savage accidents for which the mining industry is infamous. Somehow, that he writes poetry is a seamless part of his character, in the sense of the role that he plays in the film (yes, Iron Moon is a documentary, but it involves role-playing; we return to this point below). That he is more like your “regular,” old-style worker than the other four does not exempt him from economic peril. Toward the end, we learn that after a quarter century in mining, he was given a choice of being laid off or continuing at half of his wages. He opted for the latter. Wu Niaoniao 乌鸟鸟 (b. 1981, from Guangdong) reaffirms a conventional opposition of poetry-writing and pedestrian everyday existence, aka normal life. This happens when he tries to present his poetry as an asset at a job fair, and meets with incomprehension and scorn, but also when his spouse forgivingly observes that he is not a practical person. He resigns from a factory job because he knows he will be laid off anyway once his employer finds out that he has become a father again – there are many such moments in the film, that present a jungle-capitalist logic that is as baffling as it is clear. He has a hard time finding other work, but he keeps his somewhat head-in-the-clouds faith in things, not least because he wins a poetry award. And parenthood is painted as a source of hope. Wu Xia, author of the sundress poem cited above, is fascinating in that her sweatshop job does not seem to affect her capacity for happiness. Having worked for nineteen years at age thirty-three, she writes not just poetry but also fiction and short prose (散文), and she gets published. One feels that it may well be her writing that empowers her, and gives her a calm sense of agency in a situation whose bare coordinates might lead one to see her as helpless. Wu likes to wear beautiful clothes and watch herself in the mirror, which she rarely can because of a lack of privacy in her living quarters. She casually explains how having done overtime until late one night meant she could show off privately, as everyone was asleep and no one was using the shared washing facilities in the wee hours of morning. Poster advertising the original Chinese version of the documentary. One can see why the Iron Moon directors are planning to make another movie, about Chen Nianxi, the poet who traveled along for the US screenings in late 2016. Chen is suave, hip, confident, and has a great voice – at the same time as living through an ordeal that leaves the viewer reeling. His father has long been paralyzed and confined to bed when his mother is diagnosed with terminal throat cancer. Chen is a demolition expert who works in coalmines. Like Lao Jing, he has plenty of experience of losing colleagues to work accidents. His job takes him far from his home in rural Shaanxi. In a poem, he says to his son: “I want you to put down your books and look at the world / but I fear you would really see it.” The world he means is the human world (人间). And then there is Xu Lizhi, he of the iron moon. Poetry + factories is a powerful mix, and so is poetry + suicide. In China, this is no less true than elsewhere, and quite possibly more so. Here, the factory in question happens to be Foxconn, and the poet in question happens to be one of several hundred million underprivileged migrant workers; or, the migrant worker in question happens to be one of the most talented poets of the precariat. As a consequence, poetry + factories + suicide engender a near-absolute homogeneity of the image, of pure good in the face of pure evil. Xu’s only living presence in the film is his voice, in a recording made by a journalist, in which he says he has not told his family about his poetry, because he often writes about “depressing stuff”; and a few seconds of closed-circuit television footage recorded in the Shenzhen building from whose seventeenth floor he jumped to his death. He exits the elevator and walks toward the center of the building. Once the elevator’s doors have closed again and no one else is in sight, he turns around and heads for the window. Iron Moon is visually beautiful and more generally technically accomplished, in a mainstream kind of way that reflects Wu Feiyue’s extensive experience in commercial TV. The film’s pace is just right. There is a lot to the stories of the protagonists, and to the larger story of migrant labor of which they are a part, but each scene is given plenty of time to sink in, and the film never feels rushed. It unfolds in balanced sequences of public and private spaces. We see, for instance, Wu Niaoniao shouldering a travel bag in front of the Guangzhou railway station, and Chen Nianxi gently trimming his aged, bed-ridden father’s hair at home. And, of course, the spaces in between public and private that are factories, mines, construction sites and so on, and that offer spectacular material – in accelerated footage of robot-like humans at the conveyor belt accompanied by music not unlike that of the Bourne trilogy, shots from inside a mine cage sinking ever deeper into the earth, and so on. The five individual lives that emerge are cleverly interwoven, with measured signposting. Snippets of background information and poetry citations are titled in over the action, and all other spoken language comes from the mouths of the protagonists and occasional interlocutors such as family members. At the same time, one wonders how much of these monologues and dialogues and of the action at large is staged, or indeed scripted and staged, rather than spontaneous (spontaneity, of course, being a relative notion when one is filmed and knows it). Sometimes this is obvious, as when Xu Hongzhi 许鸿志 literally enacts one of his brother Xu Lizhi’s poems, describing how his room will be cleaned up after his death. The shirt hung out to dry on the balcony is just like that worn by Xu in a couple of famous photos that are all over the web, and the camera lingers on two books of poetry, Walt Whitman’s Leaves of Grass (in Chinese) and a book by Liu Chun 刘春 about Gu Cheng 顾城 and Haizi 海子, the most famous among the many contemporary Chinese poets who committed suicide. The scene is essentially theatrical in nature. This also holds for a group of migrant workers holed up in a Beijing underpass who chant their demand for delayed wages in perfect unison, in an orderly line-up resembling that of a group portrait. Their enactment of poetry recited by Wu Xia at the February 2015 symposium held in Beijing alternates with images of the poet on stage. Things are less straightforward when Chen Nianxi’s father goes into a rant about local officials with what little breath he has left, and then tells his son: “Write this all down and put it online.” The camera is optimally positioned to capture his outburst. Or at the job fair that sees Wu Niaoniao reciting his poetry to recruiters who cannot by any stretch of the imagination be expected to take an interest – and whose subsequent putdowns of Wu, from polite to blunt, fit the story perfectly. The poet as a spiritually superior outcast in a materialist world, as the loser who paradoxically exposes the winner’s sadly limited worldview and lack of morality. Documentary films come in every shade from the purely observational (even if this is philosophically and practically an untenable notion) to the explicitly persuasive, and to the hybridity of docufiction. Iron Moon is of the persuasive kind. Its core message is that (migrant) workers lead hard lives and suffer social injustice, that they have a great deal of dignity and resilience, and that their plight deserves attention and action. If this message draws on some role-playing, and on pretty heavy directing at large, including scripting and staging, this need not detract from its reliability, its significance, or its effectiveness. Qin and Wu’s emphatic presence as directors is manifest in other things as well. The team must have gone to great lengths to obtain the cctv footage of Xu Lizhi just before his suicide. They seem to have near-complete access to the lives of their protagonists and their families. Cameras are present as Wu Niaoniao cuts the umbilical chord of his new-born child, and accompany Xu Hongzhi as he goes out to sea on a hired dinghy to scatter his brother’s ashes, filmed with under-water equipment as they break the surface. This raises familiar issues of privacy versus impact. There are, well, private sides to birth and death – but then again, one can also frame these scenes as generating empathy with the protagonists, and the social class to which they belong, for the good cause. An analogous argument can be made about the film’s aesthetics. It is a far cry from the rough and/or businesslike style of more observationally inclined documentaries, in China and elsewhere. It fairly insistently takes the moral high ground, and there are moments when it is – expertly – grandiose and sentimental, with violins swelling, dramatic light, and so on, going for maximum effect. Then again, this film wants to reach, and to engage, a wide audience, and it is succeeding. Its many domestic screenings in 2015-2016 were largely crowd-funded, and it was released for cinemas throughout China earlier this year. Just like the anthology, then, once the film becomes internationally available, on DVD or otherwise, all libraries should get it. Qin Xiaoyu et al have built a modest My Poetry / Iron Moon industry: Chinese anthology, Chinese documentary, English anthology, international documentary, a public WeChat account and Chinese and English online trailers, screenings and other cultural events, merchandise, institutional and individual sponsorship, floodwaves of publicity. They appear indefatigable, as when Qin conducted a 24-hour live-streamed interview marathon for publicity on January 10-11, 2017, just prior to the cinema release – wearing a My Poetry sweatshirt. There is a lot of informal talk about all this in Chinese poetry circles these days, across the full range from praise to blame. Disparaging comments typically assert that Qin has sold out to official (官方) culture, and is building personal fame and wealth on the backs of the migrant workers whose interests he claims to have at heart. More broadly, discussions of the film’s perceived “authenticity,” or its lack thereof, bring to mind the vexed question of the power relationships that shape representations of subaltern (底层, in the Chinese context) cultural production. Keywords in a not-so-rosy view of things include appeasement and patronization – ultimately reflecting condescension – on the part of cultural elites, good intentions notwithstanding. Jaguścik offers a particularly incisive analysis of this point, significantly including a gender perspective. Disparagement of Qin et al’s project is complicated in interesting ways by persistent laments about poetry’s ”marginalization” in present-day Chinese society, attributed in large part to its unwillingness, or its inability, to engage with societal issues. Qin’s interview marathon was pointedly advertised as addressing “poetry’s existential challenge.” While that may have been overshooting a little, attention to migrant worker poetry is not just worthwhile in and of itself, and definitely also feeds into reflection on the big picture of poetry in China today. How useful is the category of Avant-Garde (先锋) poetry any longer? Who is writing what, and for whom? Speculation on Qin’s motives, or those of his disparagers, is unlikely to add much of interest to the debate. My Poetry / Iron Moon has contributed enormously to the discourse on migrant worker poetry, spurred reflection on poetry at large, helped to highlight social injustice, and made large numbers of people think, talk, rhapsodize, grumble, and generally carry on about these things, in China and elsewhere. That is a good thing. Sun Wanning, Subaltern China: Rural Migrants, Media, and Cultural Practices (Lanham, MD: Rowman and Littlefield, 2014), 160. See, for example, Sun Wanning 2014; Justyna Jaguścik, “Representation of Dagongmei in Contemporary China,” in DEP 17 (2011): 121-138 and Literary Body Discourses: Body, Gender and Class in Contemporary Chinese Female-Authored Literature, PhD diss. (University of Zürich, 2014), chapter 5; Heather Inwood, “Between License and Responsibility: Reexaming the Role of the Poet in Twenty-First-Century Chinese Society,” Chinese Literature Today 2, no. 1 (2011): 49-55; Gong Haomin, “Toward a New Leftist Ecocriticism in Postsocialist China: Reading the ‘Poetry of Migrant Workers’ as Ecopoetry,” in Wang Ban and Lu Jie, eds, China and the New Left: Political and Cultural Interventions (Lanham: Lexington, 2012), 139-157. Qin Xiaoyu 秦晓宇选编,《我的诗篇：当代工人诗典》(Beijing: Zuojia, 2015). Iron Moon, 76, 65-67, 103, 117-118, 165, 104, and 198, respectively. Accessed 8 February 2017. The blog’s home page is found here. Xu Lizhi 许立志著, 秦晓宇编,《新的一天》(Beijing: Zuojia, 2014). Qin’s explanation of his interventions is found on page p. 238. For Xu’s poem in Chinese, see Xu 2014: 204; Qin 2015: 360. Iron Moon, 93 and Qin 2015: 243; Iron Moon, 76 and Qin 2015: 220. Personal correspondence with Qin Xiaoyu, February 12, 2017. See, for instance, Sina news and Cinephilia. See, for instance, reviews in the LA Times and the New York Times reviews and the San Francisco Laborfest announcement. WeChat ID: Verse2015. The trailers are usually preceded by lengthy commercials, and found on various platforms in addition to the examples linked here, including Youku. I was one of Qin’s conversation partners.